The Screen Actors Guild Awards aren’t the Emmys, but at least they have the good sense to pay tribute to some of the extraordinary acting on “Shameless.” Over the weekend, the organization gave William H. Macy a statue for Outstanding Performance by a Male Actor in a Comedy Series. It was the second time Macy received the SAG Award for playing Frank Gallagher. 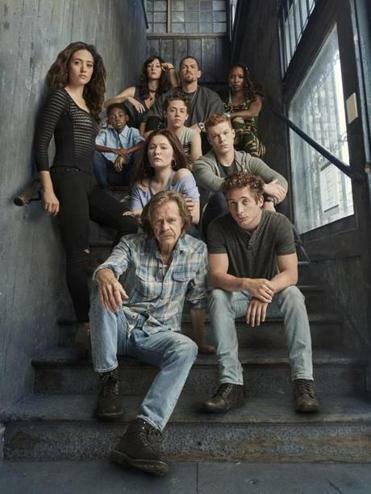 That’s right, I’m on another “Shameless” rant right now, since I am endlessly disappointed with the TV award-o-sphere for failing this Showtime series and its remarkable cast. Macy’s the biggest name actor in the cast, so he has managed to garner some awards attention over the years, as has Joan Cusack, who guest starred for a few seasons. And that’s great; Macy’s work on the show is a model of gonzo acting while in full control the whole time. He deserves each nomination and win he has gotten for this role. But the rest of the cast is unforgettable, most importantly Emmy Rossum as oldest sister Fiona, Jeremy Allen White as brilliant brother Lip, and Emma Kenney as the scrappy little sister Debbie. These younger performers have kept the show continuously entertaining, with an ability to swing between the farcical moments and the more dramatic story lines involving bipolar disorder, gay conversion therapy, alcoholism, and teen parenthood. We’ve seen the young actors grow with their characters in rare ways. Of course it’s probably too late for official recognition to start. TV awards organizations tend to repeat their nominations year in and year out, so if they don’t honor a show when its new, odds are they never will. We saw some late-in-the-game attention for “Friday Night Lights” and “The Wire,” but it was too little, too late.